Glad to see I'm in good company! How many of you even recognize this background paper? Its a real blast from the past - a set called Blue Ribbon from back in 2008. 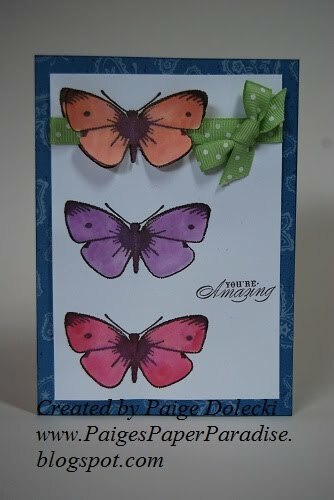 It was a fun 4th of July themed paper with pretty butterfly images that inspired the theme of this card. 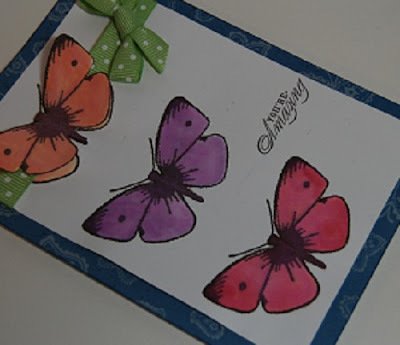 I used a very old retired CTMH botanical butterfly set to stamp the butterflies in black and filled them in with ink picked up from the lid using my waterbrush. The orange one was done twice to get one image pop dotted over the ribbon. With the exception of the waterbrush and inkpads used on this one, most of the products are retired so I won't do a product list. I hope this blast from the past inspires you to dig out some of your old stash and make a project!